Australia is known, among other names, as the Land of the Parrot. There is a tremendous range of parrot species here, including rosells, corellas, cockatoos, galahs, and budgerigars (many of which have been described in previous posts). But the thing that really surprised me is that they are everywhere. Perhaps I had this idea because of all those National Geographic specials I saw growing up, where parrots always seemed to exist in tropical rainforests, but parrots, at least in Australia, know no such limits. Yes, I did see plenty of parrots in Australia’s rainforests, but I also saw them in the cool, green, mountainous reaches of Tasmania, in the chilly, snow-capped Victorian Alps, and in surprising numbers in the arid Outback regions. Of course, by the time I was heading north for a second visit to the Northern Territory, I was no longer surprised by parrots, but I have never ceased to be delighted by them. 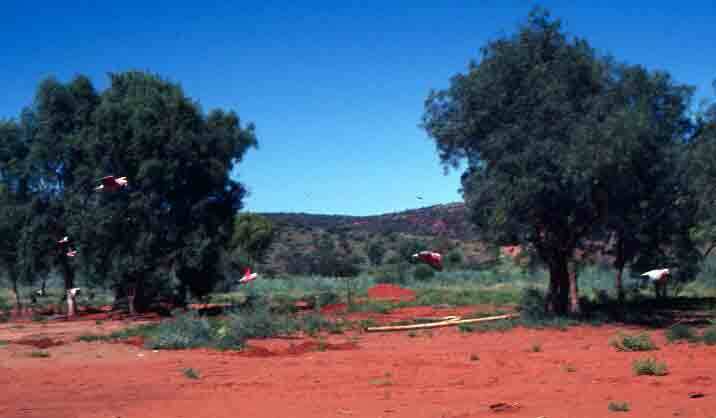 At one spot we stopped, amid the desert oaks (which are in reality casuarinas, not oaks), we startled a large flock of pink and gray galahs, who swirled into the air at our approach. You’ll need to click on the image below, to enlarge it, in order to see the galahs at all, and even then they aren’t all that clear, as they were in motion—but it makes the point that Australian parrots happily make their homes in places other than rainforests. We did eventually make it out of Marla Bore. It was a dramatic escape that started with a five-mile hike to the closest place reachable by any form of transportation. We were on the road again at last. Logistics meant we got a somewhat late start, and the roads were still ruined, so it was slow going, but we were moving north, and that felt good. I was elated to see the Northern Territory sign welcoming me back. It had only been a few months, but I was overjoyed to be returning. It was late when we pulled into a camping park at Kulgera, a small town just over the NT border. We set up our tents quickly and prepared dinner, though we made a hike to the local pub to toast our being away from Marla Bore. It would be a short night, as we’d have to start early the next morning, but we were feeling pretty good about being on the move again. And while morning did come early, it came beautifully. The photo below is the moon still in the sky as the sun rose behind me in Kulgera. I introduced the Sturt Desert Rose some time ago, in a post that also pointed out that explorers Sturt and Stuart were two different people. If you’re interested, you can read that here. 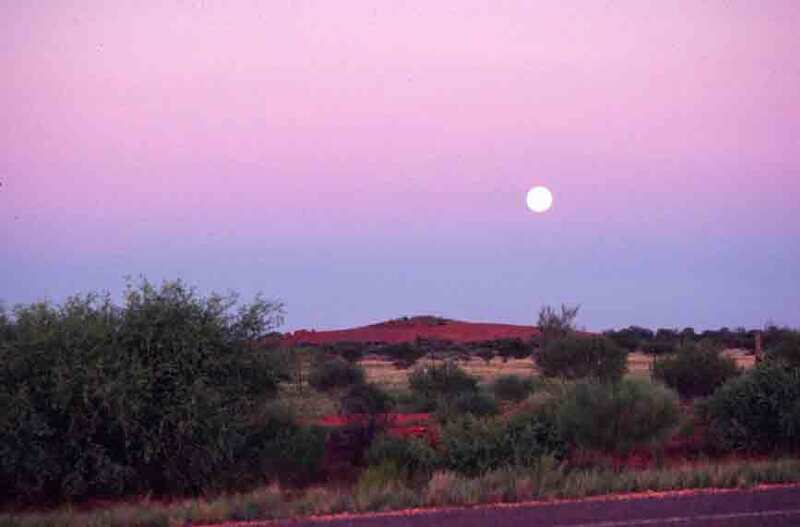 The Sturt Desert Rose is the floral emblem of the Northern Territory. 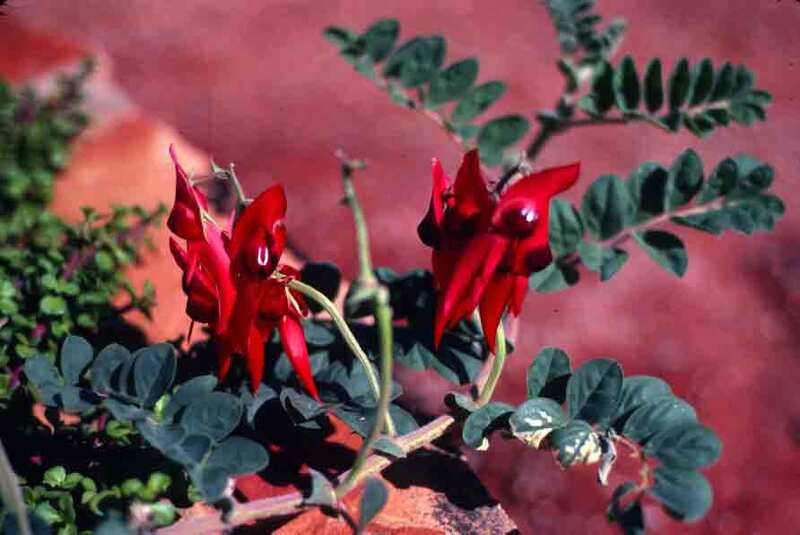 The Sturt Desert Pea, which is shown in the photo below, is the floral emblem of South Australia. Many flowers were coming out in the wake of the flood, and even plants that had been green before the flood brightened and expanded with the abundance of water. Charmed by many of the flowers I saw as I traveled around Australia, I not too surprisingly bought packets of seeds to grow in pots back home. The thing I hadn’t counted on was that many Australian plants absolutely require some sort of disaster in order to germinate. I had a good laugh when I finally returned home and started to read the instructions on the packets prior to planting my seeds. The instructions included ways of recreating the necessary disastrous conditions to get the seeds to sprout. For the fringed lilies, which germinate in forest fires, I was instructed to mound dried leaves or shredded newspaper several inches deep on top of the pot, after planting the seeds, and set the whole thing on fire. That could create enough heat to convince the seeds they’d been through the requisite forest fire. 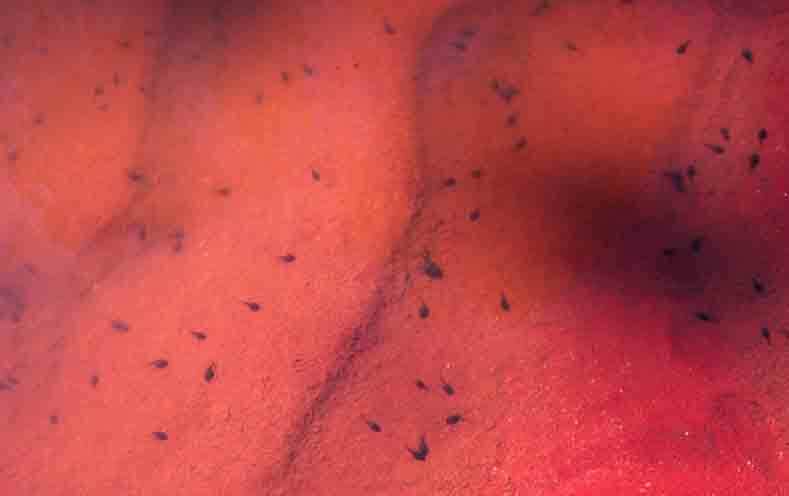 For the Sturt Desert Pea, the needed cataclysm was a flood. For these I had to soak the seeds in warm water for three days before planting, and then had to water thoroughly every day for the next few days. I had better luck with the Sturt Desert Peas, as it was easier to soak seeds than to torch mounds of leaves in an apartment building. 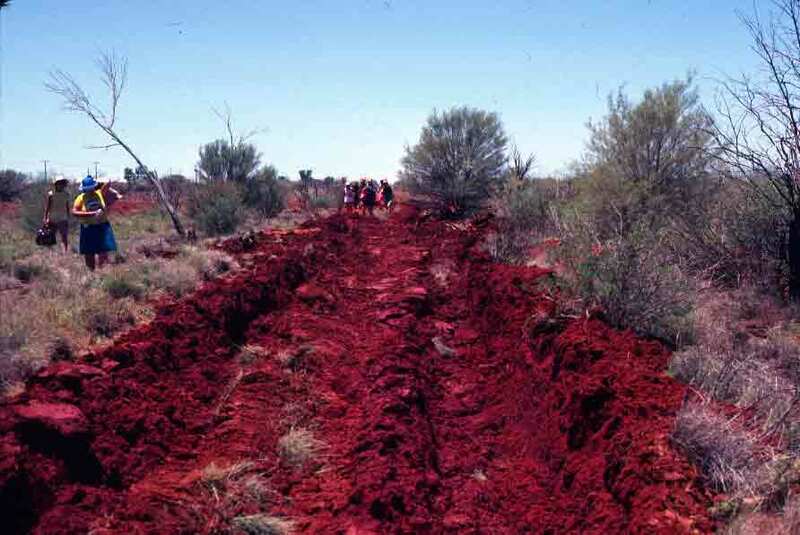 So be advised: should you travel to Australia and hope to return with some seeds to plant back home, check the package first, to find out if you need to recreate a flood or conflagration in order to get them to grow. Once the rain stopped, the temperature quickly soared to 100+ degrees. This quickly dried the surface in many places (though the really deep spots, where the water was six feet or more deep, would take a while to show any signs of diminishing). A few eager folks thought this signaled the time to depart. However, the dry surface hid a deep layer of mud, and so all early attempts ended in vehicles needing to be towed. The image below is of tire tracks from one of these ill-fated escape attempts. Well, the flood was certainly inconvenient and was keeping us from moving on, but for someone who loves nature and science, this was a real National Geographic-level opportunity, and I was enjoying myself immensely. Desert frogs, which survive underground for as long as 7 years, only come out when there is flooding. They mate and lay eggs, and if they’re lucky, the eggs will hatch and the tadpoles will grow to adulthood before the water disappears. So while it was still raining, we suddenly found ourselves surrounded by frogs. Then, within a week, after the rain had stopped, we found that all the ponds and pools that remained were filled with tadpoles. Having seen this previously on a TV special, I was thrilled to watch it unfold before me (though I wouldn’t be able to stick around for the full cycle and watch grown frogs bury themselves again). 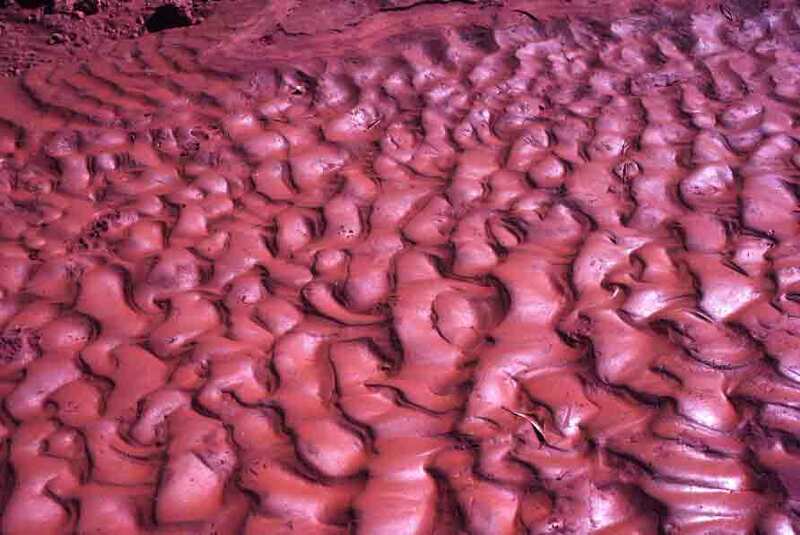 As the water began to recede, the force with which the water had flowed through some places was underscored by flattened bushes and, what delighted me more, patterns in the mud that looked like patterns on the sea floor. It was fascinating—and, as with most things I find interesting, deserving of being photographed. So here are the photos: on the left, tadpoles, and on the right, the “sea floor” patterns left by a temporary roaring river.